~ 5 Star~ Ski to your Livingroom Door! !~ Ground floor unit! #TAKE A LOOK AT OUR *ON-THE- HILL* VIDEO~~ CLICK ON THE PICTURES ABOVE- THE 3RD PIC IS A VIDEO!! It shows our proximity to the slopes and how to ski right into your living room!! No stairs, No elevators! GROUND FLOOR UNIT, NO ELEVATOR, NO STAIRS, JUST SKI RIGHT INTO THE UNIT. UNIT: Large, spacious unit at approx. 1400 sq. ft. This is a Ground Floor unit where guests can, at the end of the day or for lunch, ski right to the living room door!. 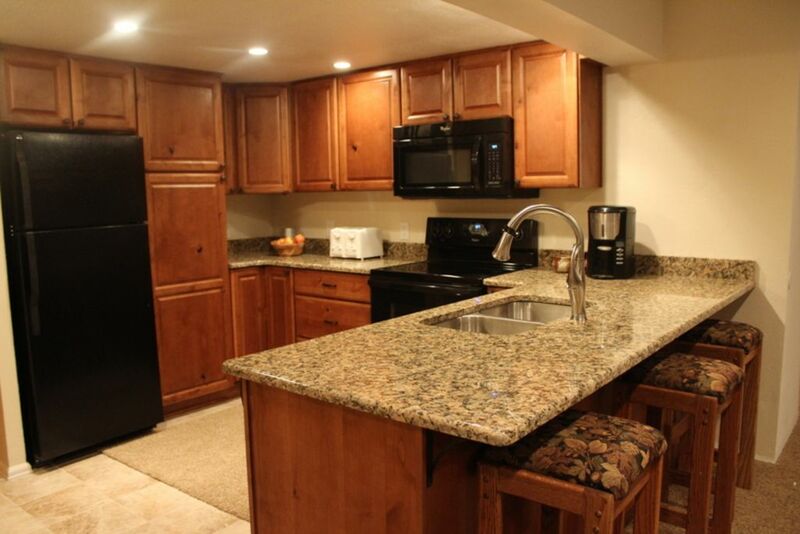 This is The place for skiers, and is a true SKI-In unit! Other units will say they are ski in-ski out, but that is not so if they are on the 2nd, 3rd, or 4th floors!! In this ground floor Unit the kids or adults can go outside after skiing and build a snowman, sled in the yard, walk out the door and go snow shoeing or walk right into town. No stairs, no elevators!. and Kids under 6 yrs. ski free! Located in the trees for views of the forest, and Ten Mile Range, very quiet and private... or go just steps into Center Village to the best apres ski Copper has to offer! KITCHEN: Kitchen is new in 2014 and everything you need is furnished. The kitchen is very well equipped, but call if there is any special request you may have. INTERNET: Condo has Wireless High Speed Internet Service and Cable. All Bedrooms are furnished with brand new queen mattresses. Purchased summer 2016. Bedroom One is located off the living room with a queen-size bed, 32' flat screen and private deck. Bedroom Two has full bathroom with 2 sinks, queen-size bed, and 32' flat screen TV. Bedroom Three has full bathroom with 2 sinks, two queen-size beds, 32' flat screen TV, mini refrigerator, microwave, and private deck. Bathrooms have been upgraded with deep tubs in two. This is so relaxing for your tired body! There is a nicely stocked grocery store in Copper Mountain Village, McCoys Market - or a Whole Foods Grocery or Safeway store 5 minutes away by car in Frisco. Heated underground parking for 1 vehicle, we have a pass available to park for free in close in B Lot parking. Additional vehicles will have to park in free Alpine Lot and take a free bus back to the condo. **Cross Country Skiing: Frisco also has a great Nordic Cross Country Ski Center. Tickets are approx. $10 per adult. **Tubing: The East Village at Copper Mountain offers a fabulous snow tubing hill for adults and kids! ** Out Back Skiing: For the real adventurous skier, Copper Mountain offers free Cat skiing in the outback. Call for more information. A large 3 bdrm, 3 bath for our family, and It's ski-in, ski-out capability! So much easier for everyone not to have to go upstairs or elevator in ski boots with equipment in hand or squeeze into an elevator with skis, poles and children!!. To be able to ski - in for lunch or to take a break, then get right back out to the lifts so easily!! Summer on Lake Dillon, 20 minutes away. Paddle board, sailboats, and canoes can be rented at Lake Dillon in Summer. This unit is a ski-in and ski-out. Play on the Copper Creek Course from June to September. INDOOR, HEATED POOL and HOT TUB Located at the Athletic Club.